This is it, folks--show time. 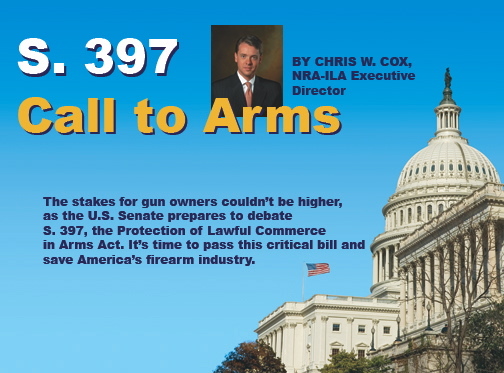 The U.S. Senate is preparing to debate S. 397, the Protection of Lawful Commerce in Arms Act. And the debate could be already underway by the time you read this column. Our national political victories during the past eight years have brought us to this moment. This is the culmination of four full federal election cycles, including two U.S. presidential contests. Without the numerous victories we have achieved at the ballot box, we would not be on the verge of this debate today. It`s worth recalling how we came to this point. In 1998, greedy trial lawyers teamed up with gun-hating politicians from big cities. Coached on with free legal assistance from gun-ban groups, they unleashed a wave of lawsuits designed to harass the gun industry into adopting the same tired gun control ideas they couldn`t push through Congress. All of the lawsuits had a common theme--that the firearm industry was somehow responsible for the unforeseeable acts of criminals who misused their products. The Clinton administration encouraged the effort, adding the threat of bureaucratic extortion by federal agencies against companies that refused to bow down to their demands. The enemies of freedom filed their suits throughout the country, in more than 30 separate court actions, and thought their job was done. All they had to do was sit back and wait for "settlement" offers from beleaguered companies that would have no choice but to embrace their poisonous agenda of new firearm restrictions. And, they chortled that NRA was powerless in the legal system. They thought they had taken our grassroots strength out of the equation. But they were wrong. The answer to the lawsuits was simple, and it rested precisely where our strength is the greatest--with elected lawmakers accountable to the voting public. Georgia was the first state to prohibit these baseless lawsuits. Now, 32 other states have followed Georgia`s lead. The issue they addressed was simple: public policy should be determined by elected, accountable lawmakers--not anti-gun activist trial lawyers and judges with personal agendas. But our rights will not be secure until every last jurisdiction in the country is covered by this common-sense legal reform. And our best chance to put national preemption of these baseless lawsuits on the books is now upon us. The fact that 33 states have already taken this step is not reason enough to force the U.S. Senate to act. Neither is the fact that the bill has remarkable support from the business and labor communities alike--from the U.S. Chamber of Commerce to local machinist unions. No, there is only one factor that will push our senators to approve this critical measure. That factor is you. The stakes of this debate couldn`t be higher. Unchecked, these lawsuits threaten not only the firearm industry but also our fundamental rights. The firearm industry has spent more than $200 million defending against these predatory lawsuits, an enormous figure for an industry that does not have deep pockets. A single financial judgment, rendered by an anti-gun judge or jury, could hurl the entire industry into financial ruin. The stakes of this debate couldn`t be higher. Unchecked, these lawsuits threaten not only the firearm industry but also our fundamental rights. A single financial judgment, rendered by an anti-gun judge or jury, could hurl the entire industry into financial ruin. Worse yet, a single judge or jury could also impose a fiendishly complex system of arbitrary new restrictions upon commerce in arms and ammunition--just because a slick trial lawyer made it sound like a good idea. In either case, our fundamental Right to Keep and Bear Arms will be reduced to a paper artifact with less strength than the thin parchment upon which it was first written. The industry is not the ultimate target of the lawsuits. The crosshairs of this courtroom harassment campaign are firmly focused on our rights. One of the architects of the global gun ban movement recently admitted as much. Natalie Goldring, executive director of the Program on General Disarmament at the University of Maryland, spoke with unusual candor about the ultimate goal of global gun registration, telling the All Africa News Service: "In order to hold governments, companies and even individuals responsible when small arms and light weapons are used illegally, it is critical to have weapons biographies." By "weapons biographies" she doesn`t mean a hunter`s journal of game taken, or a benchrest shooter`s write-ups of loading data performance. She means an exhaustive centralized registration process, tracking every location and owner of a firearm from its inception in a blast furnace to its ultimate confiscation and destruction. And she clearly means to say that everyone involved in the process, from "governments, companies and even individuals" should be held "responsible" if that firearm is used illegally. Powerless to ban all guns now, they will settle for dividing the world into two classes--those who own firearms and are thus considered globally responsible for their misuse, and everyone else. And if you protest being considered a root cause of global conflict simply for exercising your constitutional rights, international anti-gun activist Rebecca Peters has an answer for you, as expressed during her recent debate with Wayne LaPierre: "Get another hobby." It`s time for someone to get another hobby, all right. That`s the message we need to deliver to the gun-ban groups, their vulture lawyers and their cheering peanut gallery of international social engineers. And the clearest way we can send that message is to successfully urge the Senate to pass S. 397 without delay or anti-gun amendments. This objective brings necessary risk. The enemies of Freedom will stop at nothing to destroy this legislation, and their playbook is still open from last March when the Senate first debated this bill. They know that they cannot win this debate on the merits, so they will dodge and duck and delay until they can do so no longer. Then they will attempt to poison the bill with irrelevant amendments. We can expect them to push forward with an effort to ban .50-caliber rifles, and we can also expect them to try to ban handguns in new calibers they falsely portray as "armor piercing." They may also try again to ban gun shows, as we know them, or to renew and expand the Clinton gun ban on semi-automatics. Senator Chuck Schumer made their goal clear when he told reporters: "We will add amendments to this bill that may make the sponsors less enthusiastic about passing it." Subject matter doesn`t matter a whit to them. They intend to destroy this common-sense bill by tying it to restrictions on our Second Amendment freedoms. Now it falls to you to carry our standard into this battle. Contact your senators today, and urge them to co-sponsor and support S. 397. Let them know you consider any anti-gun amendments to be an unacceptable effort to kill the bill, and urge them to vote against those amendments. You can reach the Senate switchboard by calling (202) 224-3121. Tell them your state, and they will connect you. Or visit our website, www.nraila.org, for detailed contact information. Whether by letter, fax, phone or e-mail, it`s critical for you to contact your senators today. We must urge the Senate to act now, and decide whether national policy will be set by elected lawmakers or activist judges. We must restore the fundamental legal principle that people are accountable for their own actions. And we must save our rights from the relentless effort to hold all gun owners responsible for global conflict and the criminal acts of third parties.